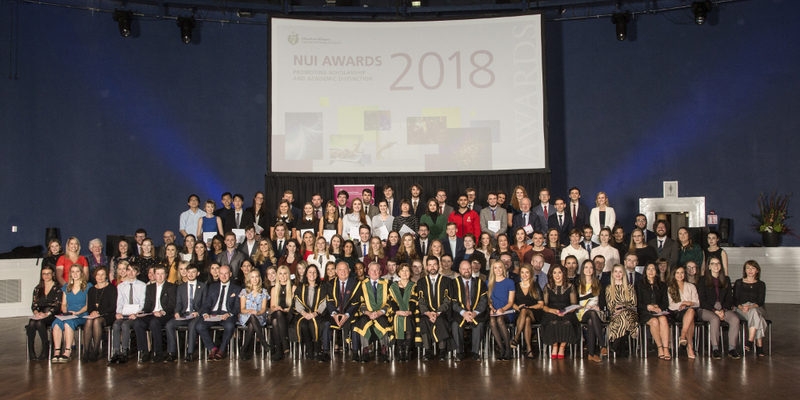 NUI Awards Winners 2018. Click to enlarge image. (C–D) Seansailéir OÉ An Dr Muiris Ó Mainín; Miriam Fitzsimons, Ollscoil Mhá Nuad, buaiteoir Scoláireacht Chiste Theach an Ardmhéara sa Ghaeilge 2018; An tOllamh Fionntán de Brún, Ollamh le Nua-Ghaeilge, Ollscoil Mhá Nuad agus Cláraitheoir OÉ An Dr Attracta Ní Ailpín. Click to enlarge image. Irish (Modern, Early, Medieval and Classical, or any combination of these) for the BA (Hons) Degree and also, where applicable, for other degrees where Irish is a final year subject, such as the BCL European and BComm International/European. Irish History for the BA (Hons) Degree. 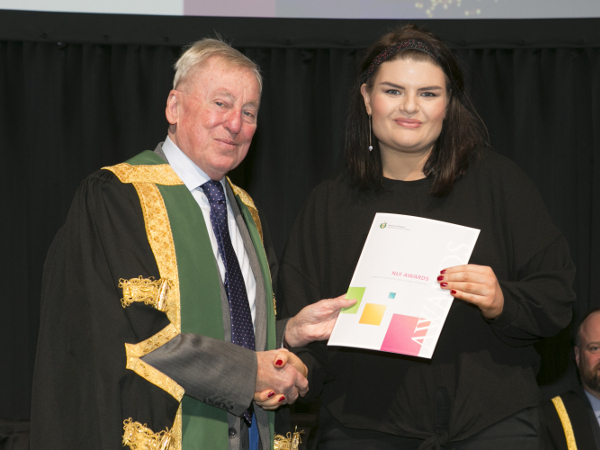 An Extern Examiner, appointed by NUI, will determine the recipients of the Scholarships and the Prizes based on the written work of final year students achieving the highest marks in Irish and Irish History who have passed the honours bachelor degree examination as a whole. Final year students of Irish or Irish History in each of the constituent universities will be eligible automatically for consideration for these Scholarships and Prizes. Seansailéir OÉ An Dr Muiris Ó Mainín ag bronnadh Chéad Duais an Dr T K Whitaker sa Ghaeilge ar Jeaic Mag Fhinn, Ollscoil na hÉireann, Gaillimh. Click to enlarge image. Sa bhliain 2017, chuir Ollscoil na hÉireann duaiseanna Gaeilge ar fáil den chéad uair i gcuimhne Iarsheansailéir OÉ, an Dr T K Whitaker. Sna blianta 2017 agus 2018, cuireadh dhá dhuais, ar luach €2,000 agus €1,000 faoi seach, ar fáil mar chomórtas do mhic léinn i mbun Máistreachtaí Ealaíon sa Ghaeilge. Is mór ag OÉ na duaiseanna seo a chur ar fáil arís i 2019. Déanfaidh painéal roghnúcháin, ceaptha ag OÉ agus scrúdaitheoir neamhspleách mar Chathaoirleach air, na moltaí do na Duaiseanna, bunaithe ar ainmniúcháin ó gach ceann de na comh-ollscoileanna. In 2017, NUI for the first time offered for competition two Irish language prizes in memory of the former NUI Chancellor, Dr T K Whitaker. 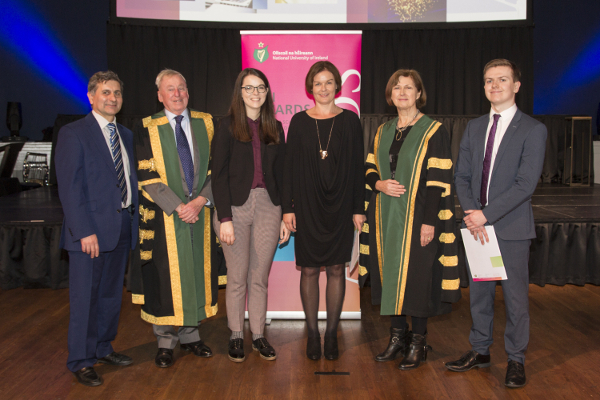 In 2017 and 2018, two prizes valued at €2,000 and €1,000 respectively, were offered for competition to students undertaking Masters of Arts degree programmes in the Irish language. NUI is delighted to offer these awards again in 2019. The recommendations for the Prizes will be made by a selection panel, appointed by NUI and chaired by an independent examiner, based on the nominations put forward by each of the constituent universities. Schools of Irish in NUI constituent universities will be contacted in the coming months regarding nominations for these awards. Rachfar i dteagmháil le Scoileanna Gaeilge ollscoileanna OÉ sna míonna amach romhainn maidir le hainmniúcháin do na duaiseanna seo. NUI Chancellor Dr Maurice Manning presenting the 2018 NUI Scholarship in Education to Daniela Donghi, NUI Galway. Click to enlarge image. 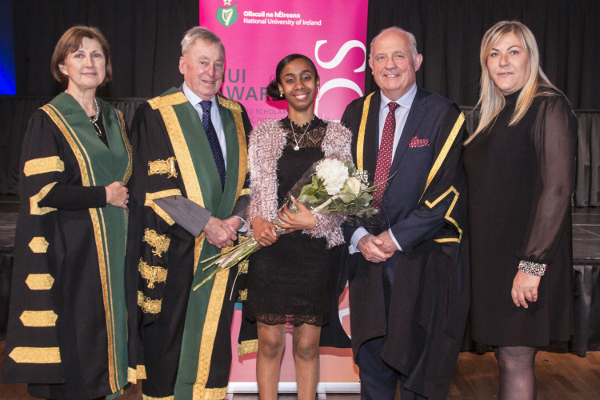 NUI offers a scholarship and, separately, a prize in Education to the top two students on the programme leading to the Degree of Professional Masters of Education or an Máistir Gairmiúil san Oideachas, offered in each of the NUI constituent universities. The recommendations for the Scholarship and the Prize will be made by a Selection Panel to be appointed by NUI and based on the nominations put forward by each of the constituent universities. 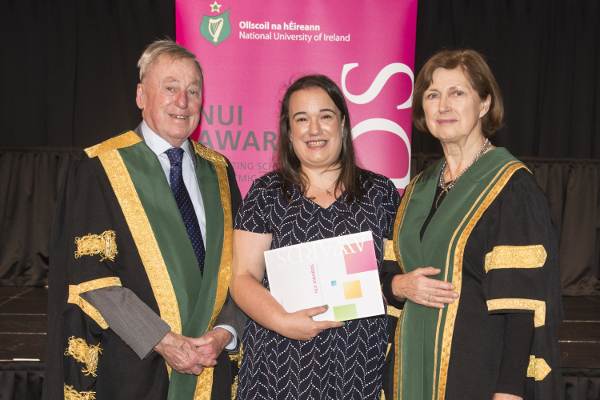 2018 NUI Art and Design prizewinner Jilly Hanrahan pictured at the 2018 NUI Awards Ceremony with NUI Chancellor, Dr Maurice Manning and NUI Registrar, Dr Attracta Halpin. Click to enlarge image. This Prize is offered annually for a piece of work by a graduate of NCAD who has distinguished themselves in one of the Art and Design disciplines. The Prize is a Purchase Prize and the work becomes the property of NUI. Final year BA/BDes and MA students in NCAD will be eligible automatically for consideration for the Prize. The 2018 Prize was awarded to Jilly Hanrahan, a graduate of Fine Art, for pieces from her installation Kaleida-Dyslexia (‘Kaleida Yellow’ pictured). 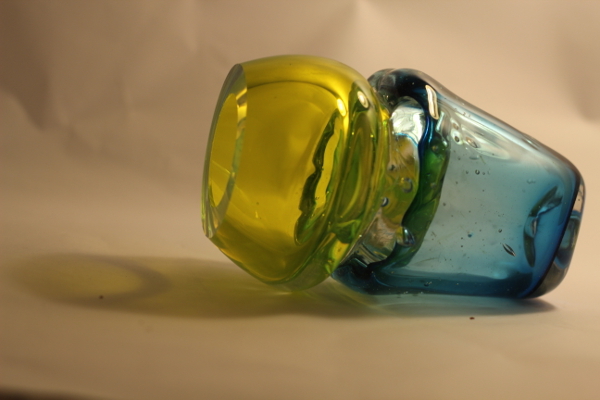 While studying in NCAD, Jilly explored form and movement through glass. She uses a technique called Incalmo which brings two glass forms together while heated. She is influenced by colour and kaleidoscopes and how they interact and blend with each other to create additional colours, and her colour palette is influenced by vibrant flowers. ‘Kaleida Yellow’, one of the pieces of the 2018 prizewinning piece ‘Kaleida-Dyslexia’. Click to enlarge image. The installation Kaleida-Dyslexia experiments with the movement of forms created in translucent colours and how lights and mirrors interact with the glass. The optical illusions within her work are created by cutting, grinding and polishing the glass pieces. Jilly exhibited at Zozimus Gallery in 2017 and 2018 where her works sold out. She was longlisted for the RDS Awards 2018, and was accepted for an internship with the glass studio Van Tetterode in the Netherlands. This Scholarship in Philosophy, valued at €2,000, is a long-standing scholarship, awarded annually, and was established with a bequest from Pierce Malone. The Scholarship is based on the corpus of written work presented by the top student for the BA (Hons) Degree examination in each of the NUI constituent universities. Final degree students of Philosophy will be eligible automatically for consideration for this Scholarship. An extern examiner, appointed by NUI, will determine the award of the Scholarship having considered the submissions from each of the constituent universities. 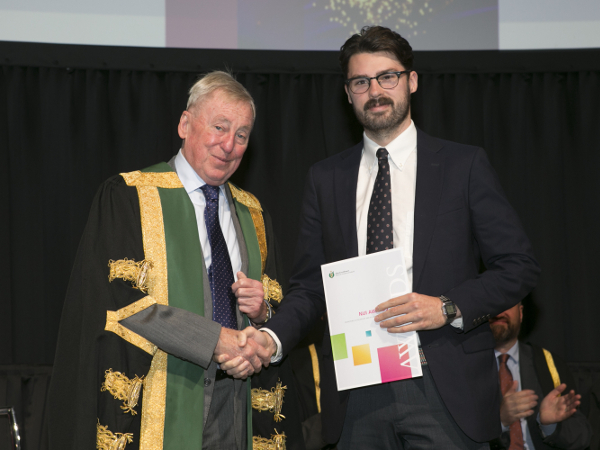 The 2018 Pierce Malone Scholarship in Philosophy went to Christopher Moore, University College Cork. In an era of globalisation in higher education, a welcome feature has been the significant growth in collaboration between Irish and French universities. In recognition of the importance of such collaboration in benefitting graduates and preparing students for international careers, NUI and the French Embassy in Ireland offer this award to highlight the collaborative programmes which have been established between the NUI constituent universities and higher education institutions in France. 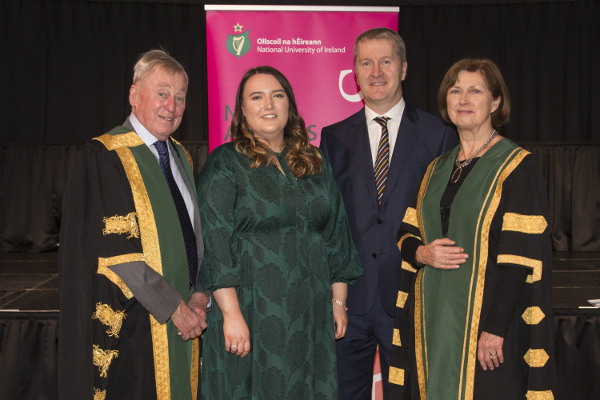 The NUI constituent universities are each invited to nominate a student who has particularly distinguished himself or herself on a collaborative programme. Dual degree programmes are particularly encouraged to participate. Each recipient is awarded a French Government Medal and an NUI Prize of €1,000. 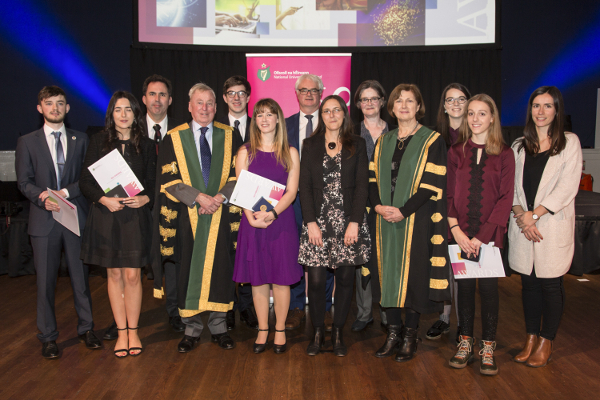 2018 NUI French Government Medal and NUI Prize recipients pictured with representatives of NUI, NUI constituent university Schools of French and the French Embassy in Ireland at the 2018 NUI Awards Ceremony. Click to enlarge image. In 1926, the French Government presented a Medal to the University to be awarded for proficiency in French, in connection with the BA (Hons) Degree Examination, on the recommendation of the Extern Examiner. The Medal was offered annually until 1956, when the French Government increased the number of Medals to three, for competition amongst students of the then constituent colleges. In 1962, a fourth Medal was added for the then Recognised College, St. Patrick’s College Maynooth. These Medals are now awarded annually in each of the four NUI constituent universities. The awarding of the four Medals continues to be based on the results of the final examinations in French for the BA (Hons) Degree and also, where applicable, the BComm International/European and BCL International Degrees, in the constituent universities. The recommendation regarding the award of the Medals is made by the Extern Examiner in French in each of the constituent universities. 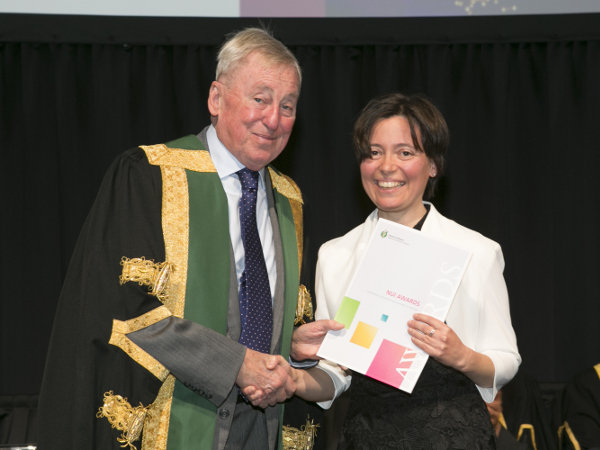 In addition to the Medal, NUI awards a cash prize of €1,000 to each of the recipients. The French Government Medals and NUI Prizes for Proficiency in French may not be awarded to any student whose native language is French. 2018 Spanish Embassy and NUI Prizes for Proficiency in Spanish winners with NUI and Spanish Embassy representatives (L-R) Adolfo Carbón, Education Advisor, Embassy of Spain in Dublin; NUI Chancellor Dr Maurice Manning; Clare Geraghty, Maynooth University; Aileen Meade, UCC; NUI Registrar Dr Attracta Halpin; Seán O’Keeffe, UCD. Click to enlarge image. NUI collaborates with the Spanish Embassy in Ireland and Junta de Castilla y León in Spain, to offer prizes for proficiency in Spanish to students in each of the NUI constituent universities. The prizes are awarded to the top students on honours bachelors’ degree programmes in each of the NUI constituent universities and are based on the results of the final year examinations in Spanish. These prizes offer each recipient a week-long Spanish language course in the Castilla y León region of Spain, accommodation and meals, a cash prize and more. The Schools and Departments of Spanish in each of the NUI constituent universities will be contacted in summer 2019 to nominate the top students in the final year of their BA programmes in Spanish for these awards. 2018 NUI Club London Scholarship recipient Shylla Auguste, Shannon College of Hotel Management (centre) pictured with Dr Maurice Manning, NUI Registrar, Dr Attracta Halpin, Dr Phillip J Smyth, Head of College, Shannon College of Hotel Management and Ilze Arbab, Accommodations Manager, Clayton Hotel, Liffey Valley, Dublin. Click to enlarge image. This Scholarship, valued at €2,000, introduced for the first time in 2005,was established as a Memorial Scholarship with funds from a bequest from the NUI Club London following its dissolution in 2003. The Scholarship is offered for competition a different subject every year. The scholarship is awarded each year to the top student on a Bachelor’s degree programme that is unique within the NUI federal system of constituent universities, their linked colleges and NUI Recognised Colleges. In 2019, the Scholarship will be awarded to the top student in the final year of the programme leading to the B.A. (Hons) in Digital Humanities and Information Technology in University College Cork.